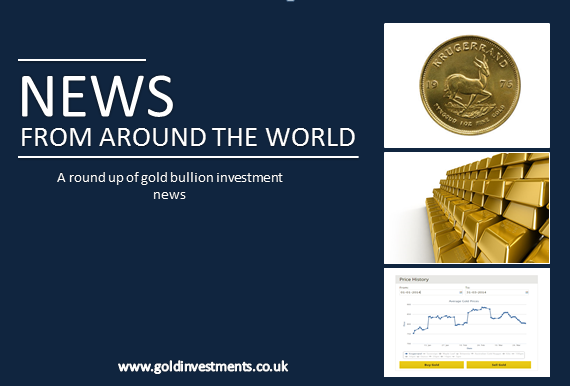 Gold prices in Britain climbed higher on Tuesday (28 April) despite disappointing data from the US and also the further weakening of the dollar. Trade has ranged from $1,199.30 to $1,214.3. Spot gold was last at $1,212/1,213 per ounce. This was $10.50 up on Monday’s close. A two-day Federal Open Market Committee (FOMC) meeting on Wednesday and U.S. first-quarter gross determined the direction of the U.S. dollar which in turn affects gold pricing. Draping With Gold for Towie? Not the ITV programme – The Only Way Is Essex – Towie but a small Scottish hamlet with the same name which could be sitting on a thick gold seam. The Crown Estate Mining has granted Turkish mining company GreenOre Gold a licence to explore the hills around the pretty Highlands village. The company believes there could be more than 3m ounces of the precious metal within easy reach. Gavin Berkenheger, Managing Director of GreenOre Gold, hopes the development will be similar to a massive project currently taking place in Northern Ireland. There, more than 3.5 million ounces of gold is planned to be mined over the next four years to five years. Many Gold investors are aware that China is building up its gold reserves. Now the country is set to launch a link between gold markets in Shanghai and Hong Kong this year following a landmark stock connect scheme. What this could mean is that China’s pricing power of gold contracts will be enhanced. It could also mean that the entire market for trading gold moves away from Western hands. This could be a challenge to competitors in the West and potentially be a serious rival to the London Bullion Market (LBM). A gold replica of Darth Vader’s helmet with minted gold coins has been made to celebrate the forthcoming seventh film of the “Star Wars” saga. The helmet – produced by a Japanese jeweller – has a value “too high for anyone to buy”. It was made in collaboration with Disney and will be on display at Tokyo’s Ginza Tanaka store. The minted gold coins are engraved with the famous villain. Gold Investments offers a wide range of gold bars and gold coins which can be purchased online. Why not buy gold now? We’re always happy to advise if you are still thinking of investing in gold – do get in touch with us today. Family Investments: How Did Gold Perform For The Akshaya Tritiya Festival This Year?